SP/IER 358 as delivered to WRM. Car 358 is a large, steel, electrically propelled, suburban coach. It has distinctive porthole style windows on the ends. The car has 3 and 2 seating and open platforms with screen gates that were manually operated from the step plates between the cars. A roller pantograph, General Electric US121-A, was used when the car was new. It was changed to slider pantographs in the early 1920s. The SP lines in the East Bay were electrified at 1200 volts DC. Southern Pacific car 358 was built for “Red Car” suburban electric railway operation in the East Bay as combine 613 as part of class 58EMCB-1. This series of cars was built by American Car and Foundry in 1911. Car 358 was rebuilt into a full coach, class 58-EMC-1, from car 613 in 1938. This car ran in the East Bay from the ferry piers in Alameda and Oakland on several lines going south as far as San Leandro and north to Albany. The car was built with large square windows in the front and rear and was painted dark olive green. The cars were repainted to Southern Pacific’s distinctive red starting in 1912 to improve their visibility in poor weather and at night. The cars received round porthole style end windows, reportedly to improve crew safety. The car had 3 and 2 seating and were very light for the number of passengers they carried. The ownership of these cars was assigned to several different Southern Pacific subsidiaries. This car was owned by South Pacific Coast (SPC) and carried these reporting marks on the side of the car until the IER took over. 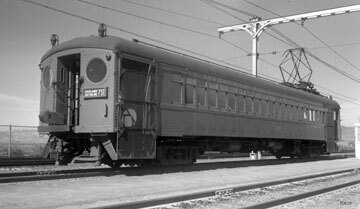 Southern Pacific’s Oakland, Alameda and Berkeley East Bay service was reorganized into the Interurban Electric Railway on November 14, 1934. With the construction of the Bay Bridge, the ferry service was discontinued and the trains ran directly into San Francisco. In 1936 Southern Pacific entered into an agreement with the California Toll Bridge Authority to deed a portion of their equipment to the Authority in return for funds to adapt their equipment for coded cab signals, speed control, automatic car couplers, and high gates for operation across the Bay Bridge. 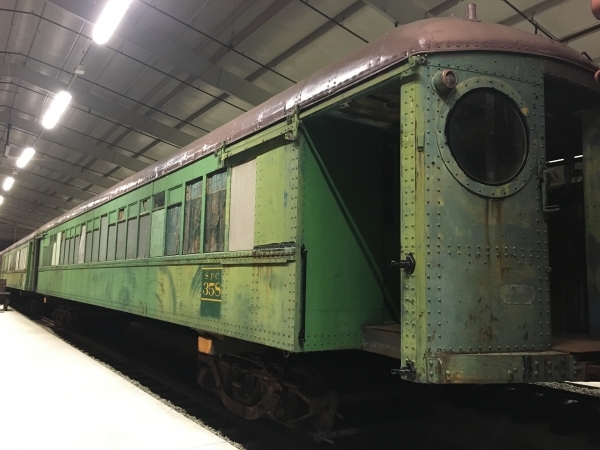 The 358 was one of these cars deeded to and ownership passed to the Authority on abandonment of service in 1941. For several reasons the operation across the Bridge did not prove to be profitable. 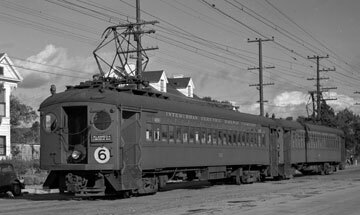 The last Red Train service in the East Bay was discontinued due to increasing financial loses on July 26, 1941. This car sat unused until the start of the Second World War, at which time it was stripped of its electrical equipment and sent to Utah for use on military installations there. After the war the car became surplus and the body was sold and used as a shed. 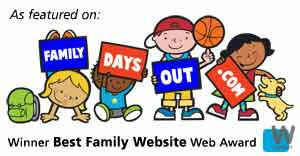 It was purchased by the Bay Area Electric Railroad Association and moved to the Western Railway Museum. Owners: Southern Pacific 358. South Pacific Coast (SPC). Interurban Electric Railway (IER). Technical Data: Lightweight steel suburban car. Built by American Car and Foundry in 1911. Seats 116 passengers. Total car weight, empty, 122,620 pounds. Trucks: Baldwin (84-35S). Wheels, (36 inch diameter steel tires on spoked centers.). Axle. Journals, (5 X 9 plain bearing). Traction motors, 4-140 horsepower @ 600 VDC, inside hung. Propulsion Equipment: General Electric type M. Master controller, (C-35-A). Switch group, (SB-6-85-A1 with DB-160 contactors). Reverser, (DB-20-A7). Circuit breaker, (DB-102-B12). Traction motors, (GE 207-A). (Gearing, bull 64 teeth, pinion 17 teeth, ratio 3.765 to 1, ?” face). Control switch, (MS-5-B). Power resistors, (General Electric type CG, form A). MU plugs, (9 point). Current Condition: This is a body only. Proposed Future Treatment: This car will be restored as a “Red Car.” There is enough electrical and mechanical equipment to re-equip one of these cars.